A Bountiful LIfe...A Civil War Bride's Quilt! Well, I have been working on my Jubilee quilt, "A Bountiful Life". Today I prepared the Bride's block...and it took almost all day. Truly, all day! I love it, though, it is a work of great fun...and I can't wait to have her features embroidered on. Then she will take a personality and life for me! I am loving this project!! 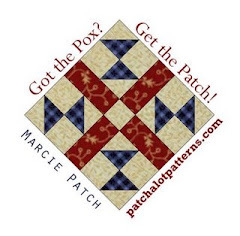 Remember the gifted plaids from my friend Ruth at the quilt shop? I put all the blocks together into this little quilt. I just need a border, of which I have no suitable fabric, so I will have to go back to the quilt shop...poor little me, LOL!! A big thanks to Michelle! I recently won these beautiful fun fabrics from her blog...thank you so much, Michelle! Please visit her HERE! HI Y'all! Above are some of the half square triangles from my current scrap quilt leftovers. I had fun this morning making a little quilt out of the pieces. I was just thinking...are we a bit nutty to cut pieces of fabric into tiny bits, only to sew it together again...to make a new cloth? I was thinking I was a bit tired of piecing..."my shoulder are sore, I need a break, I need to check the laundry, I need to check on dear husband"...I could come up with a thousand reasons why I could not piece on what I was scheduled to. But add a new idea, something I came up with, like above? The minutes whirl by, with no tiredness whatsoever! Does this happen to you?? By the way, I love pink. I think I just discovered it! It makes me happy, the subtle girlish pinks, and the in your face fuchsia above...I love pinks!! My squash are blooming!! I sure hope I have tons of squash this year!!! OK, go and snap a picture of what quilt is on your bed, quick!! This quilt is on our bed...I finished the binding on my machine, for the very first time. I have always thought that I would be cheating to do that, but 4-6 hours of hand stitching versus 15 minutes on the machine...the machine won this time! And the quilt is getting to be used, and that is wonderful! I really have enjoyed looking at these bulls eye blocks, made maybe 12-15 years ago...from what ever fabric I had, which wasn't much. Fun! I pulled this old top out of the closet...It really needs to be finished. A long time ago, Keepsake Quilting was selling a pattern for flowered blocks. I decided I could make a pattern like that too! Well, it wasn't the greatest success, but at least it is one piece, and needs quilting. I do like some of the blocks!! Hee! See those spider webbish looking strings? Typical of me!! This is what I am doing with the little half square triangles I am making...black borders, and then a sashing of some kind. I like the colors of the scraps! OK, if you have stuck with the reading of the blog this long, maybe you would like a little pink quilt. Made of leftover triangle pieces, this little quilt is hand quilted and single fold bound by hand. If you would like it, please just leave a comment, and I will draw for it at the end of the week. Hope you are having a wonderful Memorial Day, here in the states...and hope you all take a moment to remember our fallen heroes who gave their all so that you and I could enjoy Liberty. Well, I am just really enjoying clearing out that 2 inch strip and square box! I plan for a full size quilt, so I have lots of sewing ahead of me. I chose one fabric for the cream x blocks, but I think scrappy would be fun. Frankly, I usually do scrappy because I rarely have enough of one fabric to matchy-matchy, LOL! I have made some x-blocks, and am working on 16 patches. And a little more progress! I just used whatever piece was in the pile next. Today was really fun. My husband said something that he has never said before! He said, "Let's have a day today where we just do whatever we want to, not work!" Usually we have a whole schedule of have to's and should do's... Don't have to ask me twice, LOL! I found my self doing some house stuff, but just 'cause I wanted to....it was kind of freeing, not to be obligated! LInk for the quilt in last post!! Want to quilt along?? Hey, I did it!! I hope this is OK...Is it public domain if the tutorial is on u-tube? 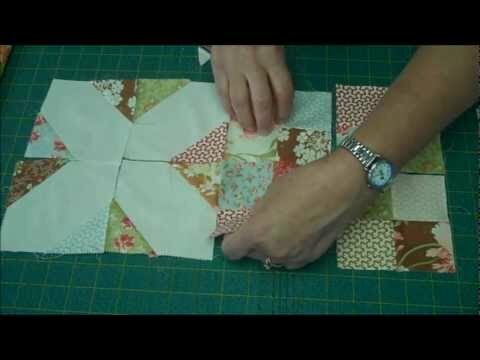 Quilt co. does lots of other tutorials too! I am so glad to have found her...thanks Nicky! Called in to work today. OK, Nicky...this is for you! My friend Nicky (blogging here), sent me the most fun video link on U-tube. The above pattern is the start of a fun scrappy quilt from the two inch strip and square box. That two inch box was not shutting either...so something had to give. I think this will be a really fun quilt when it is in one piece, even though is does not look like much now. Of course, I could have used 2.5 or 3 inch pieces...but I had the most of 2 inchers. In making the above alternate blocks for the 16 patch blocks above, I have made a whole bunch of tiny half square triangles again! so...I am sewing them into these blocks. I like them! Lots of color, and I remember so many projects I have worked on in the past...fun, fun! And little! I was called in to work today. Yahoo! that means we are busier, and not getting cancelled and put on call...yippee! He was a really strong, laborer type of guy...you know the ones: darkened skin by the sun, muscled and hard looking, scarred and calloused hands. And tough! So tough that he let his chest pain go on, and on, and on...only coming to the hospital when he was passing out from pain. A major acute heart attack! so off to the cath lab. And a fix with a stent! But....his labs belie the real story...he is fixing to get sicker...much sicker. Way too much heart damage occurred in that time he delayed coming to the hospital. The heart muscle downstream from the blocked artery causing the chest pain died. Time will tell if he will ever be able to work again. So...here in lies the message! Take your chest pain seriously...truly...and call 911 if needed. Don't delay...learn from this poor fellow!! Hi all! Happy Monday to you! I have worked the last FIVE days, all twelve hour shifts, so I am ready for a day to catch up on the house, laundry, etc...and block of the months. I love the Monday Block of the Month rehab concept that is going around in blog land! I am always disappointed in myself when there are so many great quilt ideas from all of you all, and I start out raring to go! And then life gets in my way and I get behind...so I need a plan, and then to execute! In that frame of mind, I am catching up. ON some of these, at least! Above are the crazy dogs. I did a crazy cat quilt last year, but did not do all twelve blocks. You can find these fun (and free) blocks at www.syverkstan.net. And who can resist these precious rabbits? Love the Raspberry Rabbits! What a talented designer! I still need to do the stitching and embroidery, but a lot of the tedious prep is done. Yahoo!! ALL THE REST OF THE BLOCKS ARE CUT OUT! That means I can stitch them up at my leisure, which usually means after work, and dinner, and dog walking, etc. YIPPEE! Patients are always a mystery! A nurse never knows what kind of patients (diseases or personalities!) she will get in any given shift. I was so lucky this last work period...I had some really interesting and fun, and creative people as my patients! One lady was in the hospital...she is a wonderfully talented artist and gifted me with her work, done in her hospital bed...how pretty, huh? Looks like a wonderful fabric design to me! She said she does not mind if I shared her work on my blog. Yum! Chocolate and biscuits from Germany!! Just wonderful...thank you dear patient! Thanks for letting me 'diary' a bit about my nursing...I really want to remember these moments in my career, later, maybe when I am a patient!! HI Y'all!! This string quilt is quilted, bound, washed, and ready for gifting! It is a patient quilt...we have some patients at the hospital who are really sick, and stay for a long time, sometimes, so this will go to one of these patients. I big stitch hand quilted it through each string, and washed it this morning. It is so sweet smelling, and all crinkled up just right! 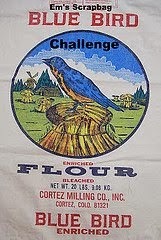 Don't you love quilts that can be washed, and crinkled, and really used? Fun!! Well, lookie! A gorgeous quilt from a gorgeous friend...it is up, and will stay up through the summer! Thank you so much, dear friend! See her blog here!! Mother's day! I hope you all had a wonderful day! I received these gorgeous flowers from my son and his wife...and they are just so pretty. Thank you so much, guys! Having you is such a joy in my life, and I could not even begin to ask for better kids! OK, I can't resist! I found some more little triangles, cut off from connector corners, and so made a tiny quilt top. It is fun to make something out of (almost) nothing! I hope you find yourself happy and blessed this day! Monday, Monday! Happy Nurse's Week! HI Y'all! I am off today, after working the weekend. I have been dreaming about nine patches, so I decided to dig around in the 1.5 inch wide bin and make some! These finish at 3 inches. I think the light one may be out of there!! I made some more! Now dear friends...I have no idea what to do with them! Please, wouldn't you help me with some setting ideas?? More pink! I found my pink strings, and just have been really enjoying the peaceful piecing. I love string piecing! My goal of 63 of these, if I have enough strings. I won something!! Isn't this pattern gorgeous? Sorry for the picture, but I am so excited about the pattern. Thank you so much, Sandy...please go visit her HERE! And an early birthday gift from my dear friend O'Faigh! This little doll is so expressive, even though she is prim style with no features...look at her tiny cute feet and hands! I love her...and her name is "Marie"! She is sitting on my mantle in the place of honor. Well...I had a birdie adventure. I was home last week, and heard a little chirp...and this baby was down on the ground. I did not know how best to help the baby, who had apparently fallen from the nest. Well, in the next few minutes, 2 more babies appeared! I think on that windy day, the whole nest was toppled. I could not find it, however. Mom and Dad Blue Jay were frantic! Circling and calling, they were so worried about their family. I called a wildlife rehabber specializing in birds, and she said I had to put them back in the nest. But I could not find the nest! So, she said to make a nest. Apparently, blue jays cannot smell, but need to hear their babies call so they will feed them. I took a wicker basket and lined it with thread and fabric, and put it way up in the tree (that was scary on the tall ladder, by the way). Low and behold, the parents immediately came back and forth to the "nest" and were feeding the babies! so, the babies were saved...yahoo!! Hey, Happy Nurse's Day all you nursing ladies!! You are vital and important and so appreciated...great work!!! Last shift, I had two LOL's. That means little old ladies, to non nursing peeps. One was 89 and the other 85, both in with similar problems, both were cross stitchers, both lived alone, both had a daughter that looked just like them! It was great fun, going room to room caring for them, they were a hoot!! !